Yes, that is Alex Anderson in the top left corner! 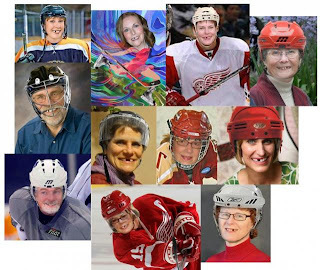 You will likely recognize a lot of other quilters here too in this collage. The "Feed Dogs" are facing off against the "Rotary Blades" in the playoffs and you can root for your favourite "player" to make the winning goal! Check out all the fun on the AAQI website here. 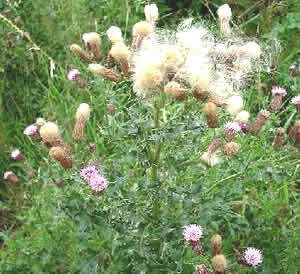 After spending an hour weeding huge thistles out of the playground by hand, ending up doing it on my hands and knees because it is easier on the back, I am recovering slowly and the only thing working is my head. But, that is good, because it gave me time to think about ideas and invite my muse for a visit! Lately I have been indulging my love for fabrics and fibers more. An example is this cushion cover I picked up at the thrift store. How could I resist this? Well, since I have it here to take a photo of for you, the obvious answer is I couldn't. But throw cushions are not a big part of my life style so, of course, this is going to become a little art quilt... The main section will be cut from the center panel and then heavily embellished with beading. The four corners will make terrific fabric for the Fast Finish Triangles for the back, all cutesy-coordinated. I'll be getting a start on this later tonight when my 15 minutes of stitching (or more!) is scheduled. I bought this at a store that was moving and had all their stuff on 75% off. I just thought all these little alphabet stamps would come in handy one day. Today, while I was resting from the weeding, the reason I bought them became evident to me. Have to admit, the muse had to kind of kick me in the head for me to realize it - good thing she was in the store with me to nudge me to pick them up. I am seeing more art quilts in the making with all those cool sayings you see and love. I tend to think of these little quilts in series and so next up will be a series of this kind. I am envisioning stamped sayings/collage/ humorous little quilts in my mind... Will post some pics when I get something concrete! Not doing tooooo badly - have 13 classes scheduled for October and November and one already for the new year. Of course, it depends if we get sufficient registration! I've also been approached by my LQS so I need to get back to them, I guess. I've made two types of classes on projects I've designed so not bad, not bad at all! Okay, forget the two a month part but I do have a good start! I have projects done, not too many, and more in the works and plans for the rest. So, if time allows homemade Christmas will be a reality! I will! Honestly, I will at least make a start on two by the looks of it. My buddy and I are organizing a full size crazy quilt as a group project for our guild so that's one, right? Sort of! And, once I get home and can set up - and leave up - the sewing machine again, I'll get started on blocks for my own. Yowsers! Only four eh? Well, nothing like being ambitious! 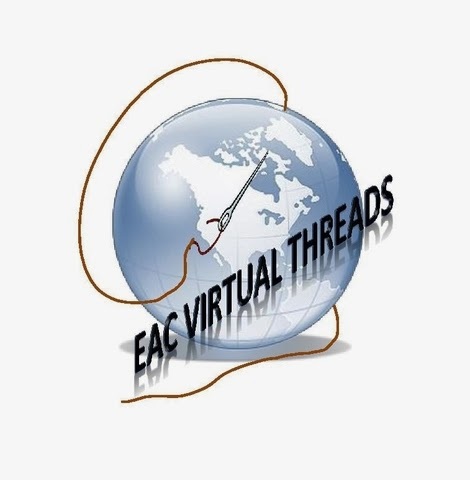 I don't think I've done any yet but am working on a name tag contest for the local guild and a logo contest for the EAC contest. That's two so it's a start - just have to get them finished now. At last! Another one I've done okay on! 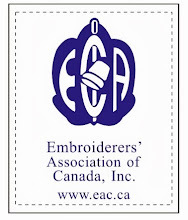 I've written and submitted an article to the Embroidery Association of Canada magazine (remember the fine print didn't say they had to actually be published - just written and submitted!) and I've committed to a write up on the Colorado retreat for another two magazines - I'll finish that up as soon as I have the photos ready after retreat. I can't say enough good things about setting this goal for yourself! Those little bits of time do add up! And, because they are often "waiting time" like at the doctor's office, the dentists, kid's sporting events, etc., people will ask you what you are doing and you get to promote crazy quilting at the same time! Bonus! More and more, I feel like a day without stitching is a wasted day! This is a goal I would like to add to everyone's list. Really! Don't let "life" get in the way of your art - this stuff we do is good for the soul and we need to feed that. It's a karma thing - you are giving beauty to the world! Oh, I am sad about this. The differences in postage and shipping with Leslie in the US and me in Canada was just too confusing! Not only for customers, but for us too! So, we'll "un-partner" on this one and each open our own Etsy shops. I have a few great things to put in there as soon as I get home and settled again - watch for a much coveted copy of Dorothy Bond's little brown book! I've actually taken to finishing a few, and incorporating a few more into other projects. Again, this is a goal that is going to be easier at home. There is only so much you can do at the lake in a little trailer! Well, I'm getting there on these, aren't I? Yay for me!! lol How is everyone else doing on their goals for 2011? I find if I don't review them like this I tend to forget they ever existed. So, come on, drag yours out, dust them off, and let's see the progress! Here is my donation quilt for AAQI for the month of August. The basis of this quilt was a round robin block that I cut up. Yes, I know, sacrilege! Well, cut it up I did. This was from a round robin very early in my cq experience and I had pieced the block from cottons in colours I just wouldn't use now. As I worked with it now though, adding seams and embellishments, I did end up with an end result I quite liked. I really outdid myself on the finishing this time - even the back is pretty! As much as I have complained lately about my job at the lake and how difficult it has become to keep up with all the physical work, if I don't come back next year there are many things I will miss. I have learned many lessons here, one as those taught by the swallows. These little birds have such tenacity, perseverance and they are downright stubborn. They come back every year to build their nests in the same spot, constructing them of dirt and spit. If their adobe-type nests are destroyed, within a day or two a duplicate will appear in the same spot and they return to business as usual. This pair of young birds has decided the place for their nest - where it belongs this year and forever - is on the outside sill above one of the outhouses doorways. I don't think they have chosen an easy path, but I am confident they will persevere and return to this spot for the rest of their lives. How much could we accomplish with this kind of tenacity? Well, this is my little quilt donation for July for AAQI. I had it already to mail and then I realized I had not put the Fast Finish Triangles on it for hanging. So, off came the binding, on went the triangles and then back went the binding. Unfortunately, since I hate "frogging" (rippit rippit) the whole thing became very late to get in the mail. Hopefully I will be forgiven! The base fabric on the front is some sort of taffeta from the stash, one of those yummy fabrics that changes colour as the light hits it. It could even be silk but I'm not sure. The back is gold silk (for sure) and the binding is a batik. Nothing like mixing it up! The kimono itself is made of quilting cotton and is a sort of folded, origami type of thing. And, yes, you are correct in assuming that one strange little button in the corner is not really an artistic statement - it is because I couldn't get that corner to miter properly. Well, it could still be an artistic statement! I don't usually do this but just had to write about my latest book purchase since I love it so much! 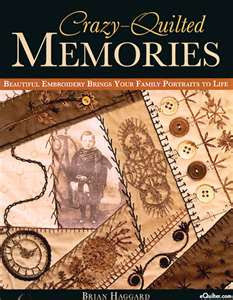 Brian Haggard has written this wonderful book, subtitled "Beautiful Embroidery Brings Your Family Portraits to Life" and the photos of his quilts, such as the one on the cover, illustrate his skill at this task. The book is full of wonderful eye candy, with his quilts and projects that incorporate old sepia tone family photos with the elegant neutral colours that make up his palette. Brian has included chapers on how to add history to your quilt, design and layout, embellishing, stitching techniques and combination stitches, 10 projects for you to complete and an inspiring photo gallery and section on design inspiration. I was pleased to find motif ideas that were new to me as well as the most adorable button bee you've ever seen! The chapter on design and layout was of special interest since it is a subject often overlooked in crazy quilting books. With good clear photos and directions, he leads you through the process of layout options, stylizing, foundation piecing, squaring and finishing blocks, sewing the blocks together either with or without sashing and binding your finished quilt. After reading this chapter I felt confident for the first time that putting together a crazy quilt was something I could achieve! This is one crazy quilting book worth reading - don't just look at the pictures! You can follow Brian on his blog to keep up with what he is doing, his travels and upcoming classes. What a wonderful surprise I received in the mail this week when this beautiful birthday ATC arrived from Marilyn. I love it! Thank you so much, Marilyn! The edging on this ATC is a very cool technique. You might want to enlarge the photo so you can see how Marilyn did it. I have to figure this out! I know, I know, you get tired of the puppy pictures, right? But you have to admit I have been good and refrained for awhile now. How could I resist sharing photos of Bear in her new bright orange hoodie though? It must be comfortable because she doesn't even mind wearing it! It will be good for the coming cold months as well because it is super warm. Such a good thing for little dogs who have to go outside in the snow and cold to do their business. How stylish and cool does she look?! The embroidered logo on the pocket on the back is "Ridedogsride" and this is where the shameless plug comes in. I am lucky enough to have the Garlands as campers out here at the lake occasionally and they have a wonderful business online called, of course, RideDogsRide, where they creat helmets, goggles, jackets, hoodies, and so much more so that folk's pets can be just as cool and safe as their owners are riding their motorcycles. I was thrilled to bits when they gifted Bear with this wonderful hoodie! Thank you Glen and Diana! Well, I can't remember the last time a couple weeks have gone by between posts but I think it has been awhile. Things have not been going that well for me out here at the lake this year - the heavy work (moving picnic tables, toting all the trash to the landfill, digging firepits, etc.) is simply getting to be too much for me and as a result I have been sore, exhausted and depressed. Now DH has hurt his back at work and although he is managing to drag himself in there every day he can't do much else, so I've started sneaking away and running home for a few hours every couple days to throw supper in the crock pot for him, mow the lawn, clean house and tend the critters. Actually, I think this may very well be the reason I have started to feel better and this cycle of depression is lifting. Maybe the key is to crawl out of myself and do for someone else?? But, I've philosophized enough, now on to some great thrift store finds! I am always on the lookout for embroidery transfers, especially the older ones. My first embroidery projects when I was a child were on pillowcases, tea towels, and other printed linens. I still love embroidered pillowcases and use them all the time. Aren't these Campbell Soup Kids just too cute? What a sweet redwork baby quilt they would make! I found all these embroidery transfers at the same thrift store and bought them all. The best prize though were these last two vintage packages. Too cool! From August 1-10 the Alzheimer's Art Quilt Initiative (AAQI) will be offering 20 quilts that were part of the "Alzheimer's: Forgetting Piece by Piece" exhibit in an online auction like no other. 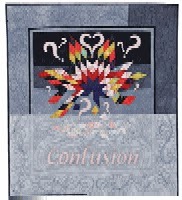 "Confusion" was created by Elsie Campbell of Dodge City, Kansas. Elsie is an award-winning quiltmaker, international teacher, writer, and editor. She is the author of Nine Patch and Snowball Quilts and /Winning Stithces. Her 75 plus awards include Best of Show—Quilt America! 2000, Mary Krickbaum Award for Best Hand Quilting—National Quilt Association, 2001, and Excellence in Hand Workmanship Award—American Quilters Society 2003. 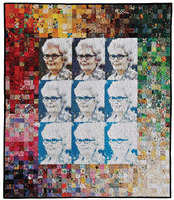 Be sure to read the Artists Statement on Elsie's quilt! Quilts made by Sue Nickels, Diane Gaudynski, Marsha McCloskey, Nancy Brenan Daniel, Melody Crust, Mary Stori, Elsie Campbell, Debbie Bowles and others will be auctioned. This is a rare opportunity to acquire quilts by nationally acclaimed quilters who rarely sell their work! "A Day With Beebe" is another quilt on the auction block, this one created by Marsha McCloskey of Eugene, Oregon. Marsha is one of the quilting world’s best-known authors and teachers. She has written or co-authored more than 20 books on quilt making since 1981. Specializing in traditional designs, such as The Feathered Star, she has taught drafting, rotary cutting and machine piecing to quilters all over the United States and in eight foreign countries. She has her own small publishing company, Feathered Star Productions, and has designed lines of quilting fabric for In The Beginning-Fabrics and Clothesworks. Read more about this quilt here on the AAQI website. "Research Now…There’s still Time", created by ﻿Nancy Brenan Daniel of Precott, Arizona. This little quilt is a combination of photo transfer, machine piecing and machine quilting. Nancy is a traditional and a studio quilt maker, designer, and teacher. As the granddaughter of a quilter she has had a lifelong interest in the art. After the university she began her professional life as an art educator. Today, she is a skilled designer and teacher, as well as a prolific author of books and magazine articles – mostly about the art of the quilt. Read more about Nancy's quilt on the website. Another of the quilts for auction is "Nevilyn", created by Linda J. Huff of Algonquin, IL. Artist Statement: Nevilyn was born June 14, 1915, and she is my grandmother. She learned to sew because as a child she had rheumatic fever and was never allowed to do anything strenuous. In January of 1936 she married Jerry and they started their family. Mostly they worked and lived their lives, struggling through the tough times and rejoicing in the good times. When it was time to retire, Grandpa hooked up a travel trailer to his truck and told Grandma they were going to visit all of the places they had always wanted to see. If they did those things now, he insisted, when they got too old to travel at least they would have the memories of all that they had seen and done. In 1999 Grandpa died. Then Grandma was diagnosed with Alzheimer’s. The woman who sits in the nursing home today has no memories of friends or family or the special things that she and her husband did especially for this time in her life. Nevilyn was once lively and vibrant. In the end only a ghost of her former self remains. There are 868 small squares in the border. They speak of so many things in my grandmother’s life: the fabric that she worked with to make clothes and quilts, her attention to small details, her desire that things be done the “right” way, and her love of color. They also symbolize all of her memories, funny stories, sad times, the trips she took, and the things she has done. All the little pieces of her life are now lost to her forever. Please go visit the auction today. By viewing the quilts and reading the stories, you will raise your awareness of Alzheimer's Disease and its impact. And if you find a quilt you just can't live without, so much the better!